Conventional X-ray CT scanners have limited ability to distinguish low-contrast substances. However, spectral CTs with photon counting detectors can identify photon energy and utilize spectral information, which is expected to achieve improved contrast. Energy weighting is a kind of reconstruction method for spectral CT. By assigning appropriate weight for each energy channel, the image contrast can be improved. Hence, how to determine the optimal weights is very important. 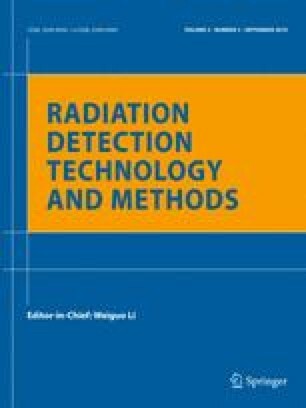 In this paper, we developed an improved projection-based energy weighting model for spectral CT. In this model, the object thickness of low-density materials is assumed as a constant, and the measured spectrum distribution is used to calculate the weight coefficients. Both phantom and tissue experiments were conducted in spectral CT scanner. The results showed that the thickness of low-density materials has little influence on the energy weight, so it can be regarded as a constant. For low-contrast phantom, the contrast-to-noise ratio was improved ~ 32% by the proposed projection-based weighting method. The improved projection-based energy weighting model is effective in practice. It can increase the contrast of low-density materials. This work is supported by the National Key R&D Program of China (Grant No. 2016YFC0100400, Ministry of Science and Technology of the People’s Republic of China), the Instrument Developing Project of the Chinese Academy of Sciences (Grant No. YZ201511), the Key Technology Research and Development Team Project of Chinese Academy of Sciences (Grant No. GJJSTD20170005).